You’ve seen his name on the NorthStar Nutritionals blog and web site. You’ve felt his enthusiasm practically burst off the page. You’ve read his suggestions and come to trust his opinions. 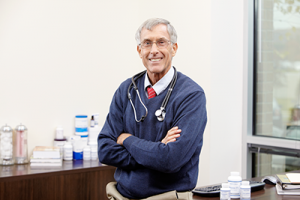 But maybe you’re still wondering, who exactly is Dr. Allan Spreen, the doctor behind NorthStar Nutritionals? What Is Dr. Allan Spreen’s Background? Dr. Spreen’s fascination with optimal health started back when he was a high school diver in the 1960s. As his athletic career grew, so did his desire to understand health and athletic performance. While he was an athlete throughout high school and college, by the 1970s he was also beginning to transition from athlete to coach. This new position of coach, guide, and mentor, as well as performing at an even higher level of competition himself, drove him to learn even more about physical performance for young athletes. But it was a personal experience that fueled a passion in him. In the 1960s, when his sister was a sophomore in college, she was diagnosed as schizophrenic. The consulting physician not only disparaged the family by blaming them, but insisted that the damage was done and there was nothing that could help the young woman. He insisted she would spend the rest of her life institutionalized. Luckily, the family refused to listen and found Dr. Abram Hoffer in Canada, who was treating schizophrenics with high doses of B-3 and other supplements. Within two years, Allan Spreen’s sister wasn’t just functioning, but was in law school and headed to a bright future. And the passion for finding alternative, non-conventional ways to achieve health was born in Spreen. By the late 1970s, he realized this passion was leading him to medical school. In 1982, he graduated with his medical degree from East Tennessee State University and went on to become a general practitioner. The combination of medical acumen and athletic prowess drew the attention of the U.S. National and Olympic diving teams, both as an athlete and a coach. As an athlete in his own right, he became a medal winning diving champion. By 1991, he had transitioned to coaching the U.S. national diving teams. And by 1996, he had become known as the Nutrition Physician, sharing his knowledge not only with athletes, but with us here at NorthStar Nutritionals – and with you. Dr. Spreen also serves on the advisory panel of the Health Sciences Institute. What Does Dr. Allan Spreen Believe? Most importantly, Dr. Spreen believes we can all be healthy. Healthy to a degree most of us have never even imagined. By educating ourselves. By asking questions. By taking control of our own bodies. Too many supplement companies jump on a bandwagon because an ingredient is popular or a mineral is in the news or because a vitamin is the current fad. So these companies quickly throw this new ingredient into their products, without researching quality or proper amounts or even interactions. And people take the pill because someone tells them to. This goes against everything Dr. Allan Spreen believes. First, he insists that all NorthStar Nutritionals products have quality ingredients. The purest, most effective nutrients available to us. Second, he knows the most impactful amounts of those nutrients. And what he doesn’t know, he takes the time to learn. Which means the products he formulates and endorses are the best possible combinations they can be, to help you achieve Dr. Spreen’s ultimate objective – your maximum health. At which point, he brings you the information he is confident about, and the products he can stand behind, in order for you to make the best decisions for you and your health. Because that’s what Dr. Allan Spreen believes in, and works for – you and your good health.